Weekend Happy Hour snacks are the best!! It's only 3 ingredients!! You can handle 3 more items on the grocery list...right!!! By the way, these aren't burnt. Purposely charred for some extra flavor. These little mini sweet peppers are cut open with a small opening and seeds removed. Then plop in 1/2 stick low fat mozzarella string cheese. Put on a baking sheet and place in the oven at 400 degrees for about 5-7 min then a quick broil for about 3 minutes longer. 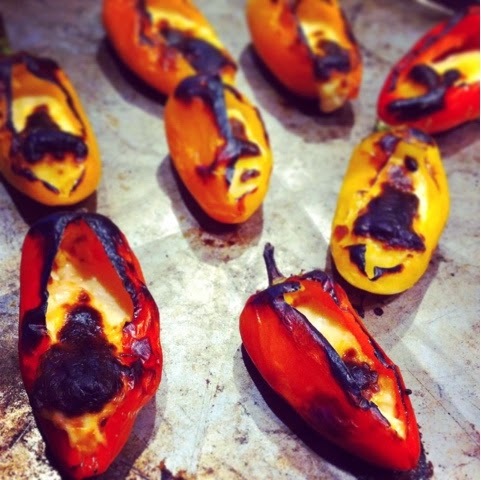 Watch your broil time - you want a bit of char on the pepper and cheese...this brings out the smokey flavors. Now the best part, warm up some marinara sauce and dip away! Is your happy appetizer for 1, 2 or a group? You decide the portion amount to make. WARNING these are delicious and you can't just eat ONE!! What a great idea. I will be making some soon. I am adding it to my healthy foods on pinterest. Thank you.